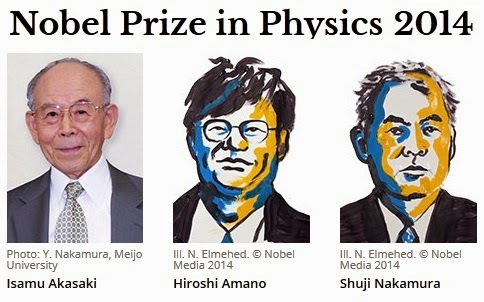 Nobel Prize in Physics 2014 was awarded jointly to Isamu Akasaki, Hiroshi Amano and Shuji Nakamura "for the invention of efficient blue light-emitting diodes which has enabled bright and energy-saving white light sources". The awarding committee said the trio's work is in keeping with the spirit of Alfred Nobel, the founder of the prize, because LED lights save on energy, last long and are environmentally-friendly because they don't contain mercury. In the spirit of Alfred Nobel the Prize rewards an invention of greatest benefit to mankind; using blue LEDs, white light can be created in a new way. With the advent of LED lamps we now have more long-lasting and more efficient alternatives to older light sources. When Isamu Akasaki, Hiroshi Amano and Shuji Nakamura produced bright blue light beams from their semi-conductors in the early 1990s, they triggered a funda-mental transformation of lighting technology. Red and green diodes had been around for a long time but without blue light, white lamps could not be created. Despite considerable efforts, both in the scientific community and in industry, the blue LED had remained a challenge for three decades. They succeeded where everyone else had failed. Akasaki worked together with Amano at the University of Nagoya, while Nakamura was employed at Nichia Chemicals, a small company in Tokushima. Their inventions were revolutionary. Incandescent light bulbs lit the 20th century; the 21st century will be lit by LED lamps. White LED lamps emit a bright white light, are long-lasting and energy-efficient. They are constantly improved, getting more efficient with higher luminous flux (measured in lumen) per unit electrical input power (measured in watt). The most recent record is just over 300 lm/W, which can be compared to 16 for regular light bulbs and close to 70 for fluorescent lamps. As about one fourth of world electricity consumption is used for lighting purposes, the LEDs contribute to saving the Earth’s resources. Materials consumption is also diminished as LEDs last up to 100,000 hours, compared to 1,000 for incandescent bulbs and 10,000 hours for fluorescent lights. The LED lamp holds great promise for increasing the quality of life for over 1.5 billion people around the world who lack access to electricity grids: due to low power requirements it can be powered by cheap local solar power. The invention of the blue LED is just twenty years old, but it has already contributed to create white light in an entirely new manner to the benefit of us all. What’s a blue light-emitting diode: You probably know light-emitting diodes as LEDs. They’re little light bulbs that don’t rely on the filament you can see burning inside an old-fashioned bulb. Instead, electrons move through several layers of semiconducting materials – directly converting electricity into light, sparing the heat-waste of a traditional bulb (and keeping your fingers from getting burned!) Even in fluorescent lamps, which use less energy than fluorescent bulbs, the gas used creates both heat and light. A red light-emitting diode was invented during the 1950s, but without that magic blue light we couldn’t create white – and if LEDs couldn’t light up our homes, they just weren’t living up to their full potential. The discovery: All three Nobel laureates are Japanese by birth, and worked in Japan at the time of their discoveries (Nakamura is now an American citizen, and serves on the faculty of UC Santa Barbara). Akasaki and Amano worked together at Nagoya University, and made early breakthroughs in the development of the semiconductor materials necessary for creating the diode during the 80s. In 1992, they presented their first working blue light.